You’ve spent good money on a stylish Brabantia pedal bin, but the poor thing is suffering – you’ve been forced to use any old plastic bag to line it, and it looks awful! Scraps of plastic peek over the rim, it doesn’t fit properly, and when it comes to emptying it, you have to watch out for the dreaded SBC: Sudden Bag Collapse. 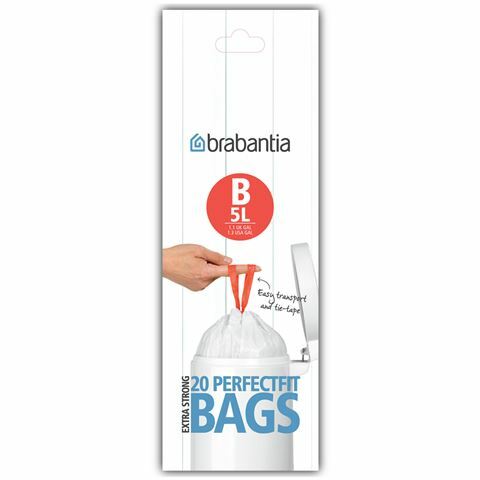 Bring some dignity back to your bin, and keep things neat and tidy for yourself, with Smartfix bin liners from Brabantia. These extra-strong bags are made to precisely fit their full range of pedal and waste bins with no ugly overlap, and their tie-tops make lining and emptying the bins so much easier! Made from environmentally-friendly, recyclable polyethylene. Presented as a pack of twenty.